The new Colin Farrell movie Ondine. The two main actors in Ondine..Colin Farrell and Alicja Bachleda..look so good together..and they fell in love in real life..how cool. Colin Farrell says falling in love with his 'Ondine' co-star Alicja Bachleda-Curus was "profound" and "pretty cool." The Polish actress and Irish born actor now have a son together. ONDINE is the story of Syracuse, a simple fisherman who catches a beautiful and mysterious woman in his trawlers nets. The woman seems to be dead, but then she comes alive before Syracuses eyes and he thinks he may be seeing things. However, with the help of his ailing, yet irrepressible daughter, Annie, he comes to believe that the fantastical might be possible and that the woman (Ondine) might be a myth come true. Ondine and Syracuse fall passionately in love, but just as we think the fairytale might go on forever, the real world intercedes. Then, after a terrible car crash and the return of a dark and violent figure from Ondines past, hope eventually prevails and a new beginning is presented to Syracuse, Ondine and Annie. Ondine is a fantasy-drama film directed and written by Neil Jordan and starring Colin Farrell and Alicja Bachleda. The film tells the story of an Irish fisherman named Syracuse (Farrell) who discovers a woman named Ondine (Bachleda) in his fishing net whom he believes to be a selkie or mermaid. Different theories about her origins come about as she integrates herself into the community. Syracuse's partly-disabled daughter Annie, comes to believe that the woman is a magical creature, while Syracuse himself falls in love with her. However, like all fairy tales, enchantment and darkness go hand in hand. * Colin Farrell plays Syracuse, an Irish fisherman. * Alicja Bachleda-Curus plays Ondine, a woman he discovers in his fishing net. Filming began on July 18, 2008 on location on the Beara Peninsula in Ireland, and was scheduled to finish on August 6th, 2008. As of January 2009, the film is in post-production. 'Ondine' had its European premiere as part of the Jameson Dublin International Film Festival on February 18, 2010 in Dublin, Ireland. The film is currently set to be released in the United States on June 4, 2010 by Magnolia Pictures with a MPAA Rating of Pg-13 for some violence, sensuality and brief strong language. We were lucky enough to catch up with actor Colin Farrell and director Neil Jordan about Ondine, a movie set in a remote coastal town in Ireland, where Farrell plays a local fisherman named Syracuse who catches a beauty in his fishing net. His physically disabled and his on-dialysis young daughter believes the mysterious stranger is a selkie (a mermaid based on Irish folklore). Without doing a total spoiler, it turns out to be a human. The mermaid is played by Farrell's real-life girlfriend, shapely Polish actress Alicja Bachleda, and she told us that she was still able to keep everything on the set completely professional even though her and Farrell are a well publicized "item" and have a nine month old son together. For someone who's got a real bad boy rep in Hollywood, we found Farrell to be completely down to earth--and it looked like the stylist got a hold of his normally shaggy locks and gave him a Hollywood hipster "messy but it takes work" 'do right before the big press day and premiere of the film. 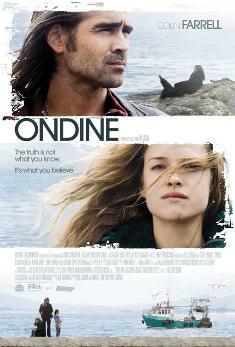 Ondine is in theaters now and is well worth checking out--whether you believe in mermaids or not! Question: We have to find out about your swimming skills! Neil Jordan: You can't swim? CF: Not really, no. It depends on how close I am to shore. I'm not a good swimmer. I've got a family of good swimmers, all the kids. My brothers and two sisters are great swimmers, but I could never swim. Q: In Ondine, why is the mermaid so special to you, Colin, and why is she so different from the rest of them? CF: Syracuse is someone that equates love to loss, in all aspects of his life. His mother has just recently passed. His daughter his terminally ill. So he just equates love to loss and he's kind of fine with that. There's no kind of self-flagellating pity going on his life. Then this woman comes in and she's very different. By the mere nature of catching her in the net - it's a little bit odd from the start. It's not like he met her in a pub or over a nice portion of fish and chips at the local chip shop. This woman brings something into his life that he doesn't quite comprehend. She represents that thing that transcends the drudgery of everyday existence, the kind of wee insertion of love into his life. Q: Neil, you have a history of making "fractured fairy tales". Is there a meaning behind that for you? NJ: Yeah. The reason that I like fairy tales � this sounds stupid � is that even when I was doing Mona Lisa, Bob Hoskins kept relating his character to the Frog and the Prince. I like stories or characters that don't fully understand themselves. I've never made an entirely realistic movie ever in my life. I suppose that I was told too many myths, legends, and fairy tales when I was a kid. My father was a national school teacher and he used to terrify the life out of me. Everybody in Ireland comes from some weird rural background but he told me a lot of ghost stories that I've probably never recovered from. NJ: Yeah. It's [based on] a great book. Q: I love that book. Can you talk about that? NJ: Yeah, I'm trying to make it. Studios don't seem to want to make anything that's remotely interesting at the moment. It's kind of depressing. I was meant to be doing it in September, but I'm doing a TV series for Showtime about the Borgias family. So hopefully I'll start pre-production in September. The money is gradually falling into place, but it's a bit of a struggle. Q: Colin, you've played some brutal and aggressive characters in the past. So what was it like playing this gentle, loving guy? CF: It was really nice to be able to play a character that wasn't burdened by the notion of responsibility or wasn't consumed with the idea of pretense, even in an unaware way. So there was a simplicity and a humility to the character that was really, really lovely. It was somebody that had both removed himself from the societal grid and had also been kind of ostracized from the community as well. It was the first time in twelve years I got to play a character that I wasn't looking forward to leaving. I felt, like, "I'm going to miss Syracuse a bit"--even his name. Q: Can you talk about what drew you to this story that's so rooted in magic and Ireland? NJ: What brought me to it is that I've made a lot of harsh movies in Ireland. I've made a lot of movies with violence. I thought, could I make a film that was terribly simple and terribly forgiving where nobody dies in the end and nobody transforms into some ghoulish, some monstrous thing. That's all. Q: Is there a comfort in shooting in Ireland that you like? NJ: No. Ireland is very expensive to shoot in, or well, it did get very expensive for about ten years. There was a thing they called a Celtic Tiger, this mad building boom and the area that we shot this film is one of the few places on the western seaboard that's not been ruined by building hotels and all the other stuff. So that was one of the reasons that I wanted to do the film, too. I didn't want to prettify the country but there is an extraordinary beauty to that landscape and I thought that I would love to get to photograph it before I die. That's part of the reason that I wrote the film. Q: Can you talk about your female leads, the character of Ondine and also Alison Barry who's so stunning? NJ: Okay, yeah. It's hard to put together independent movies at that moment. It's like, "Okay, you've got Robert Duvall and you've got Johnny Depp. Can we also have Jennifer Aniston or we can't sell it in Hong Kong," or something. So I cast Colin and they give the project to these international sales company. They do what they call running numbers. CF: I'm not too big in Hong Kong, either. NJ: But people would say, "If you have Colin Farrell and so and so." For Alicija (Bachleda), I thought she should be unknown because I want to see someone that I've never seen before which very rarely happens unless you cast kids. I saw a lot of East European actresses and Alicija came in one day and she gave this reading, read the part and I thought, "She's really making this work. This will be interesting." Then I watched her work and I thought she was a really great actress. She had a very difficult part to play because her character, she's playing the interpretation that other people put onto a character. That's a very difficult thing to do. Q: And working with Alison [who plays your daughter], Colin? CF: Alison, yeah, she's lovely. She's really smart, really bright and really kind and loads of fun to be around. Some of my favorite scenes in the film are the scenes that are of just Syracuse and Annie while she's going to get dialysis. There's a real kind of simplicity to them and an unspoken depth of love. Q: Why do you think you're misrepresented in the press, Colin? CF: I don't know. We all as human beings probably do a good job of misrepresenting ourselves a lot of the time. The press has got it's space to fill. I've read some nasty, nasty things written about through the years and I've read some really nice things written about me. Neither of them really hold the essence of truth as I would like to ascribe my thoughts to it. Q: There's a lot of myth versus reality in this film. Do you see a lot of myth versus reality in your career as an actor? Q: But who you are and the kinds of characters that you want to play? CF: No. I mean we all have possibly to design our lives to a certain extent. Some of us are born into a particular demographic or a situations which are very hard to design anything but the needs of survival in that. But I've been very fortunate in my life and I've had a chance to design through the work as well where I want to go or what questions I want to ask or what issues I want to take a look at, just personal issues or human issues or existential issues in my own sort of way. So with that in mind the work is really interesting. I don't do it for therapeutic reasons at all. I would be a basket case if I did, like if it was therapy. But it is interesting to approach the idea of walking in another man's shoes. I don't think I answered any of your question. Q: Is there a comfort to shooting in Ireland, Colin, or maybe is there a feeling of more pressure when you're shooting there? CF: I love Ireland very much. One of the most beautiful parts of the world that I've ever been to is the Beara Peninsula [peninsula on the south-west coast of Ireland] and I did my first job there twelve years ago. I did a four part mini-series for the BBC called 'Falling For a Dancer'. It was great to go back to that part of the world and working with a director/writer that I'd wanted to work with for seven or eight years on a story that was so inherently beautiful. And I worked with some of the drivers and caterers that I'd known for 12, 13, 14, 15 years. Those are happy days. Q: It just came out in the press that you turned down Terry Gilliam's much beleaguered Quixote interpretation. Q: I think so, a couple of days ago. CF: Show it to me and ask me that question. Q: What's next to come then? CF: I don't know. That's all I know, that I haven't got anything lined up and I'm just reading a lot of stuff. It seems to be an interesting time, you've probably heard, for filmmakers and obviously more and more and more importance is being placed on the big tent pole films and it's kind of hard for the lower bracket, the middle range, the $20 million films to be made it seems.